Israel has recently launched new attacks in Palestine. It has been a constant that Palestinians are abused and attacked regularly by Israeli forces but recently after the kidnapping of some Israeli teens, Israel has launched another operation in Gaza and bombed houses, killing civillians as revenge. Here are some confessions from IDF personnel who felt the weight of the crimes they were commiting and witnessing beared too much on their own conciences. http://www.theguardi...tine-occupation - May Allah give more people the strength to break free of evil. Btw I wonder if the feud between Israel and US is growing, hard to believe though. Israelis torturing non-Jewish children. 2014 Australian documentary film. Viewer discretion. Hamas is also constantly firing rockets at Israel and the Israelis have declared an open hunting season on all Palestinians....West Bank and Gaza both. Already a Palestinian teenager has been brutally murdered...burnt alive to "avenge" the death of those Israeli teens......it is such an unfortunate situation. The struggle is too real out here. ISLAMABAD: Foreign Office spokeswoman Tasneem Aslam on Wednesday said that Pakistan condemns Israeli aggression and supports the international community’s efforts in bringing about a cessation of unilateral Israeli strikes killing Palestinians, including women and children. “Pakistan is deeply concerned over the recent escalation of violence and loss of lives in Gaza and has consistently supported the Palestinian cause, especially the two-state solution which paves the way for a viable, geographically contiguous Palestinian state, created on the basis of pre-1967 borders, with Al Quds Al-Sharif as its capital,” she added. In 2008 war when hamas called for help saudis told them to "grow up". Now since they "grow up" now fighting for saudis and similar in Syria these guys can provide them the weapons they require or find some other way to push israel back and end the conflict other than some symbolic phone calls. Maybe they can put up a drama and israel can push back temporarily if there is some more use for them in Syria or hamas can call their fighters back from Syria and funnily pretend that nothing happened and give us weapons to Iran their previous provider. Since Hezbollah is fighting against the front that hamas is in now it would be very stupid even for hamas to think of some support from the north. It is simple. mb rule in Egypt was becoming a burden as the attempt failed in Syria and ended its shelf life and it was removed possibly with american support to get on well on the track with Russia for their aim to negotiate against Syria and Iran. A lot happened since then that continiously showed american face over and over like the saudi-qatari.. chemical attack in Ghouta/Syria. hamas also was used among other mb fools for american agenda and fought against Syria for saudis or other american stooges. they were fools to not to see beyond past revenge for mb against Syria and some secterian motivated caliphate dreams of several american stooges. Now since it is understood that they cant mange victory and cant be used anymore in Syria israel does not need to wait further just like separation of Iraq to 3 plan did not need to wait further and action was taken immediately. Apart from these I think in this case hamas is of no importance but the Palestinians as a whole are. Other parties like Islamic Jihad can get weapons from Iran and can give them the basic equipment or necessary equipment temporarily to take it back afterwards. #10 For the Glory of Pakistan. They still have to answer the cries of Kashmiris next door , Plestine is too far. When Iran will burn Israel ?? Since it is not a computer game you cannot attack whenever you want knowing that you can play again from the save point or rain thunderbolts over the enemy when your powers charge. you need weapons, superior technology and economic advantage to overwhelm the enemy and in that case ofcourse if they are not fools they won't attack you. In current case you protect yourself and use their aggression power against them whenever possible for their every move but without making foolish actions which have no return. It is like a chess game that once you lose you cant play again. that is why when israeli jets attack Syria for provocation they cant return fire back or several times bombings happened and palestinians didnt escalate the conflict. However as I mentioned previously now mb is a liability for america and israel to accomplish their aims remove Syria, Hezbollah and Iran in order and hamas links to Iran is weakened because of hamas actions against Syrian govt. Since they are at their weakest stage and have no use very possibly to create the cause for war israel killed several of their own with silenced pistols and accused hamas. After several days of bombing and selective reading from the zionist american media palestinians had to respond back with their full force with rockets. Then the usual zionist warmongering after rockets saying that no country can stand while they are targeted with rockets hiding firstly the starting israeli false flag and secondly their continious bombing and escalation of conflict to this stage. IJ and hamas can dig in and continue with rocket barrages to specific military sites. But at the same time they should say they are open to indefinite ceasefire as long as isr stops raids. Meanwhile countries should push for pressure against israel focusing on the root cause which is the lie behind it which is the false flag not the current escalated point that isr says no country can allow rockets as if rockets started the war. the false flag and israeli escalation bombings brought conflict to this stage. Countries should push israel back by saying that a war cannot be started with a semi-non investigated crime. Where are the 'Muslim' regimes? Well they are busy protecting their chairs and protecting Israel, from "terrorists"
All are approval junkies expecting praise, honor, blessing and compliments from west so they don't label them with the word "terrorist"
The Saudis are very quite. Normally they are vying for the blood of Iran so why not Israel. These Saudi rulers support Israel indirectly when they invest billions in the US and buying American hardware. What is needed is a revolution to topple the Saudi rulers who seem to be puppets to Israel and the Americans. you are unduly harsh on Pakistan. Pakistan participated in the 1967 war and the 1973 war against Israel despite having fought wars of its own in 1965 and 1971. Considering our economic position and military strength what more do you want? Pakistan has sacrificed itself again supporting mujahedeen groups from Kashmir to Chechnya to Bosnia. We have fighting an internal war against rouge elements for the last 10 years. What else do you expect from Pakistan? When all it has left to sacrifice is its sons, it does that too. The Arab states and the Turks who border Israel should stand up to march to Palestinian aid first, followed by the wahhabis and the Persians. Once they stand up, watch how Pakistan will stand side by side with them. On every occasion where Pakistan could fight for Palestinian liberation, it did. Don't ignore the facts just because it is fashionable to kick Pakistan. A very good post Plat. I would also like to add to those people who want to see concrete action, especially from the "illegitimate" state of Pakistan....they know they are not going to get any. Time to book an air ticket perhaps? Our newly appointed made in USA Khalifa Abu Bakr al Baghdadi is more concerned about dreaming of invading other Muslim countries even though he could have made a push for the Israeli border from Syria. Rulers of Arab states surrounding Israel, specially Sisi, are actively or passively supporting Israel in killing their fellow Arabs. Us Muslims are funny. In Iraq alone more thousands of innocent Muslims have been killed in the last month alone and we cant come to an agreement to condemn this horrific act. Yet when Israel kills 100 Palestinians then we go all nuts. Moron with a Pakistani flag, always feel the need to shine even when it's not their event! Resistance groups should keep the ieds and atgms and snipers ready for a land incursion. Meanwhile it should be said that if there is a guarantee that the israel stops raids and ceasefire will begin. resistance groups are ready to stop rockets taking the first step. as the zios are giving the usual excuse after they false flag and escalate and resistance groups respond back pretending the rockets are the initial root cause. But there should be a guarantee. since everything can come from zios who killed their own with silenced pistols to start a war. The zionists will try to escalate the conflict more to make it more difficult to return back to ceasefire. land operation can begin soon. Before that it would be wise for Palestinian resistance groups to announce that they can take the first step stopping the rockets if it will result in israel stopping attacks afterwards ensuring a ceasefire. Any protests in Pakistan about that? NO, we are protesting against current government and usually block road and create panic when some one of our own sect dies only. 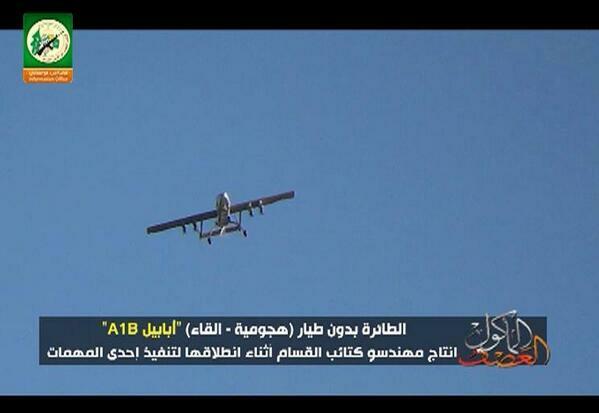 Ababil A1B UAV manufactured by Al Qassam Brigades in Gaza being used in the current conflict, one was reportedly shot down by Israelis today. I think it has 4 rockets attached to the wings if im not mistaken. The armed wings of both Hamas and the Palestinian Islamic Jihad (PIJ) have announced they are now armed with an array of new, longer-range rockets that they have made themselves: a development that makes the militants less dependent on rockets that are smuggled into the Gaza Strip to threaten Israel's main population centres. The revelations came as the Israel Defence Forces (IDF) launched Operation 'Protective Edge' to suppress the escalation in Palestinian rocket attacks in the wake of the kidnap and murder of three Israeli teenagers in June. Palestinian militants have used improvised rockets since October 2001, but the improvements to the weapons were only gradual until November 2012, when Hamas launched the first two M75 rockets from the Gaza Strip into Jerusalem during the IDF's Operation 'Pillar of Defence'. At the time there was scepticism that Hamas could produce such a long-range rocket, but Lieutenant General Benny Gantz, chief of the IDF general staff, confirmed in July 2013 that the 200 mm M75 rocket was being produced in the Gaza Strip. He said it has a range of 80 km: slightly longer than that of the Iranian-made Fajr-5, which was previously the longest-range rocket known to be in the Gaza Strip. The IDF released estimated Palestinian rocket inventory figures on 10 July showing that Hamas now has 400 rockets with a range of up to 80 km, while the PIJ has 100. This is in addition to hundreds of self-produced Grads (the generic name for 122 mm artillery rockets) with a range of 20 km and improved Grads with a range of 45 km that both groups are holding. While mass-produced 107 mm and 122 mm rockets that are smuggled into the Gaza Strip still dominate the Hamas and PIJ inventories, about 40% of the rockets that have a range of 20 km or more are now made in the Gaza Strip, according to the IDF figures. The IDF also stated that Hamas now has "tens" of rockets with a range of between 100-200 km. One such rocket landed in Hadera, 116 km from the Gaza Strip, on 8 July. The IDF identified it as an M-302: its designation for a Syrian-made 302 mm rocket. While this is the first indication that these rockets have reached the Gaza Strip, Hamas said it had launched a new R160 rocket that it had produced itself. It said it used another new type of rocket called the J80 to attack Tel Aviv. The IDF found 40 M-302s on the cargo ship Klos C it intercepted in the Red Sea in March. It said there were several versions with ranges that vary from 90-200 km depending on the size of the warhead. Israeli officials said at the time that Iran was trying to smuggle the M-302s to the PIJ, which is now widely seen as Tehran's primary Palestinian ally. However, the IDF inventory figures did not list the PIJ as having any 100-200 km-range rockets, suggesting Hamas is believed to be the only recipient of the M-302 to date. The PIJ, meanwhile, announced the first use of a new rocket called the Buraq-70, saying on 8 July that one had been launched against Tel Aviv. On the following day it released a video showing what it said was a Buraq-70 on a launcher inside a tube that had been buried in the ground at a fixed launch trajectory. PIJ propaganda is also emphasising the group's ability to launch salvos of rockets from concealed bunkers and mobile launchers mounted on the back of pickup trucks. While most of the multiple rocket launchers (MRLs) seen in PIJ videos are short-range systems, Hamas released a video showing a fixed launcher for four M75 rockets. A Hamas security official told IHS Jane's that MRLs were being fielded in an attempt to overwhelm the IDF's Iron Dome rocket interception system. "We try to deceive the Iron Dome by firing dozens of rockets at the same time and from different places toward different targets, which will distract its detection system," he said. At the time of writing the IDF had not revealed Iron Dome's interception success rate. It stated on 10 July that more than 470 rockets had been fired from the Gaza Strip since the start of Operation 'Protective Edge' on 8 July. It said 87 had been intercepted and 350 had hit Israel, but did not say how many of the latter threatened populated areas defended by Iron Dome batteries. The Israeli newspaper Haaretz reported on 9 July that the Iron Dome batteries were achieving an interception success rate of nearly 90%: a better performance than they achieved during Operation 'Pillar of Defence'. It was reported on some Pakistani news channel that a group protested against Israel in Karachi. Ceasefire should be the primary option as israel with overwhelming force mostly palestinian civilians will pay the price as the war continues. rockets alone wont help much and will be used by israel to portray itself as the victim especially when collateral damage occurs killing their civilians eventhough israel initiated the conflict by killing their own teens and continiously murder Palestinian civilians. It is a very difficult situation that the Palestinians are living in under israeli blockade with shortages of their basic needs. However refusing ceasefire even it is based on legitimate concerns under current circumstances would have more costs than benefits. Are the resistance groups certain that launching rockets for a little longer will force israel to lift the blockade. if resistance groups close themselves to ceasefire israel will portray itself as the one who wants peace and will say resistance groups dont want peace they will show the resistance groups as the reason of conflict even it is the other way around and they will attack more harshly killing more Palestinians indiscriminately. it doesnt matter ofcourse how it portrays itself or the resistance groups but the best way to remove blockade should be being open to lowering weapons and at the same time revealing the lies which is the false flag israel killing their own to ignite the war instead of launching rockets for 10 more days and israel killing 1000 more Palestinians. as always zionists have broken the single hope for the continuation of the ceasefire and attacked. Last time in the war I have written that the artillery rockets are ineffective. They just create air pressure and sharapnels destroying the buildings. Molotov cocktails are much more effective in a place of crowded buildings like israel. Can rockets be turned into flame bombs like pouring oil into the rocket warhead part instead of explosives. Flame bombs would have tremendous effect on military sites. Flames would be unstoppable. Hezbollah needs to consider this as well while preparing for a future israeli assault. currently it is risky for them to intervene the conflict if possible Palestinians should try to cope with the invaders as much as possible. but molotov cocktail rockets would be much more effective in my opinion. I am asking generally out of curiosity; the isil forces which emerged out of no where few months ago; why aren't they aiding Palestine if their cause is to liberate Muslims from oppression? Jazba....ISIL is just a terrorist group...perhaps the richest terrorist group in the world right now but a terrorist organization nonetheless. Their sole purpose is to shed blood of muslims only...cause instability in those muslim countries where there is even a little bit of stability. Metonia, i am sure if Mehdi will co e he will also be declared terrorist by opposition. I need to see any. Muslim power risiist further disection of muslim umma and try to create a muslim khilafa. Ironically only these so call terrorist orginizations like taliban and isis follow the course of muslim unification and.reviival of khilafa so far. U know why igot regected from ISSB because i anawered that i wojld lkke to see army cheif as Khalifa . Anyways what i see a lot of youth Plestinians have. They need to recruit kids from 15-20 and give them. Basis training and ship them to isis to get battle hardened. They might loss 5000 out of 20000 recurited but once they will return after year of experience and along with their freid they can teach israel a firm lesson. If Mehdi goes on a bloodthirsty killing rampage in the Muslim lands and instead does not lay a single finger on the real oppressors than he will be labelled as a terrorist and rightfully so. Read Jazba's question right above my post....I was answering that. Look...this is a genuine suggestion and without any sarcasm *at allll*......ISIS have already established a caliphate and united large parts of Iraq and Syria...abu bakr al-baghdadi has given out the call for all the muslims to join his newly established caliphate and help. What are you waiting for? This should be a dream come true for you.....you will achieve nothing in Pakistan or this forum.....this is the high time...a time for action....why are you not joining the caliph and his endeavours? Maybe Iraq is a bit too far you......but Afghanistan is right across the border.....why not go there and help in unifying the muslims? prove themselves worth a migration yea people will move .